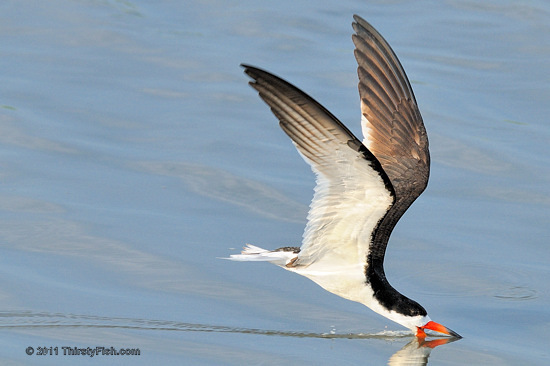 The Black Skimmer is a remarkable marine bird with a distinctive elongated lower mandible. It hunts small fish by skimming its lower bill through the water. There are only three species of skimmers in the world and the Black Skimmer breeds exclusively in the Americas. It flies in a light graceful way and hunts both during the day and at night. A flock of skimmers are collectively known as a "conspiracy of skimmers".